With all the intention to keep up with tatting, my tatting 'purse' travelled with me to places. But, for reasons, at the end of the day, doing some tatting was the last thing on my mind, apart from the fact that I could hardly keep my eyes open by the time I went to bed.!! Having been to the Tatters' Guild of Australia, NSW Branch, monthly meeting and Christmas party last Saturday 17th December, and have become the Guild newsletter editor reminded me that I hadn't done any tatting since April....I have planned to 'play' with the long arm quilting machine during the end of the year break. Unfortunately, I injured my right knee at the start of the holiday. Not being able to move around much or (machine) sew up a quilt top for quilting, I have picked my tatting shuttles again and finished this tatted edge doily (and of course, it's in shades of blue). 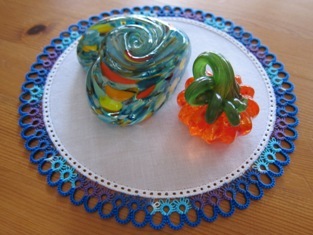 I made a similar doily once before, in different colours, for my dear friend, Marijke. The variegated cotton thread and hemmed cotton doily were from Handy Hands Tatting.... I live in a relatively big house but I can't seem to easily find a spot to place my handwork, where I can, now and then, look at and admire it. 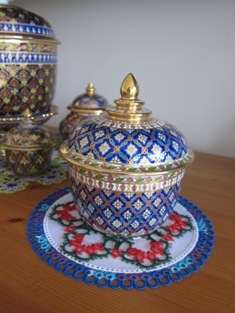 Putting one doily on top of the other gives a different perspective to the pieces. Until I can find 'good' places for both of them, they are staying together for now.!! Thanks very much, Michelle for your compliments. :-) Cheers.